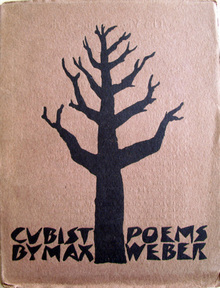 Known primarily as a painter and printmaker, the Russian-born Max Weber (1881-1961) was also a poet. 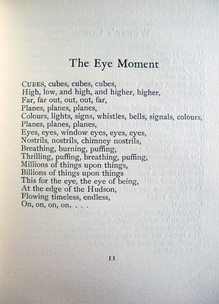 His first book of poems, Cubist Poems (1914) was written while lecturing in art history at the Clarence H. White School for Photography. 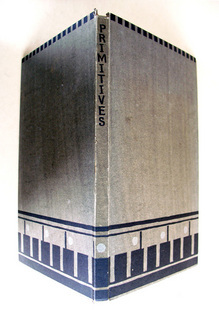 The book was dedicated to the pictorial photographer Alvin Langdon Coburn (1882-1966), who wrote a brief foreword and published in London by Elkin Mathews (1851-1921), where Coburn’s Moor Park was published the following year. 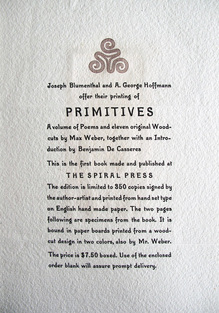 Twelve years later, Weber’s second book of poems, Primitives: Poems and Woodcuts, was published in an edition of 350 copies by Spiral Press. 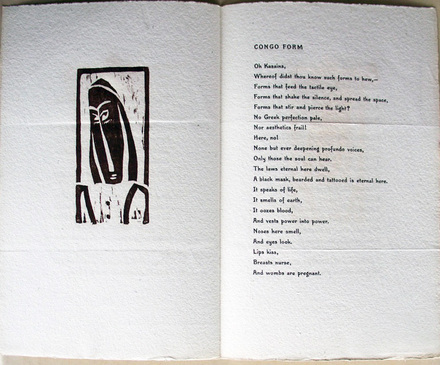 He not only illustrated the work with eleven woodcuts but also designed the binding. Weber and his family moved from Russia to New York City in 1891. 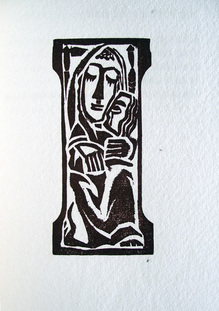 He enrolled at Pratt Institute to study with Arthur Wesley Dow (1857-1922), who taught him to carve and print in wood. Weber became a public school teacher for several years but gave this up to study painting in Paris from 1905 to 1909. 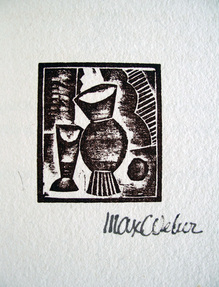 The artist was not only inspired by the cubist style of painting he saw there but also by the French appreciation for African or what he called the primitive arts. 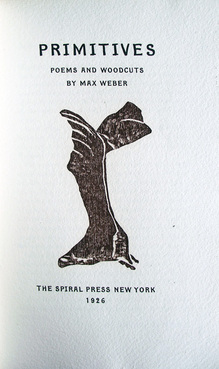 Back in the United States, Weber frequented New York’s Museum of Natural History and, in 1910, published the essay, “The Fourth Dimension from a Plastic Point of View” in Alfred Stieglitz’s journal Camera Work. 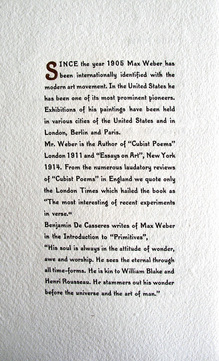 Barely three years later, Weber was given a one-man exhibition at the Newark Museum, arguably the first modernist exhibition in the United States.